And so begins planting season 2016, today was Jerrys second full day. He has started on the home fields first planting Fontanelle 13V843 corn. The bottom he is working on right now is planted at 28,000 population (seeds per acre) and most hill ground is planted at 25,000 population. The bottoms have better yield potential so farmers will push the yield and back off on the hill ground. He is planting the corn at 2.5 in depth and running at 5.5 mph. 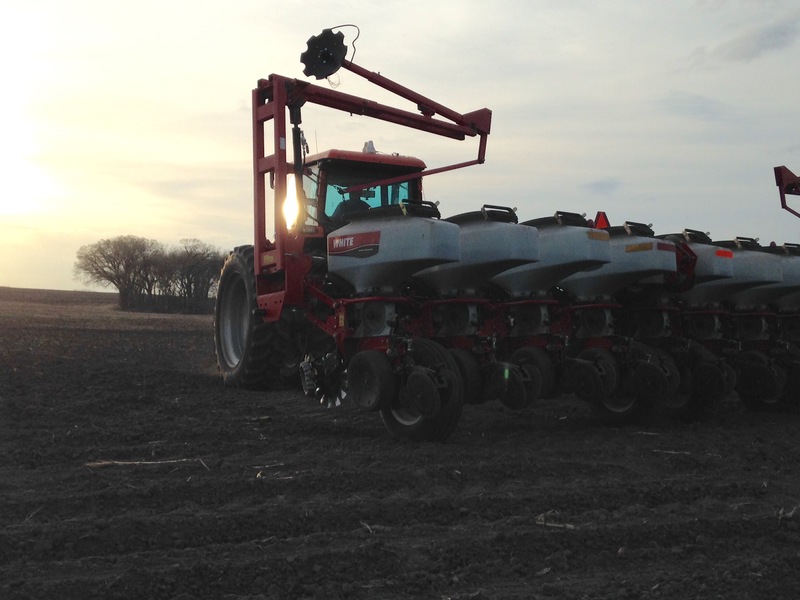 Jerry uses two guidance systems and a monitor when planting. 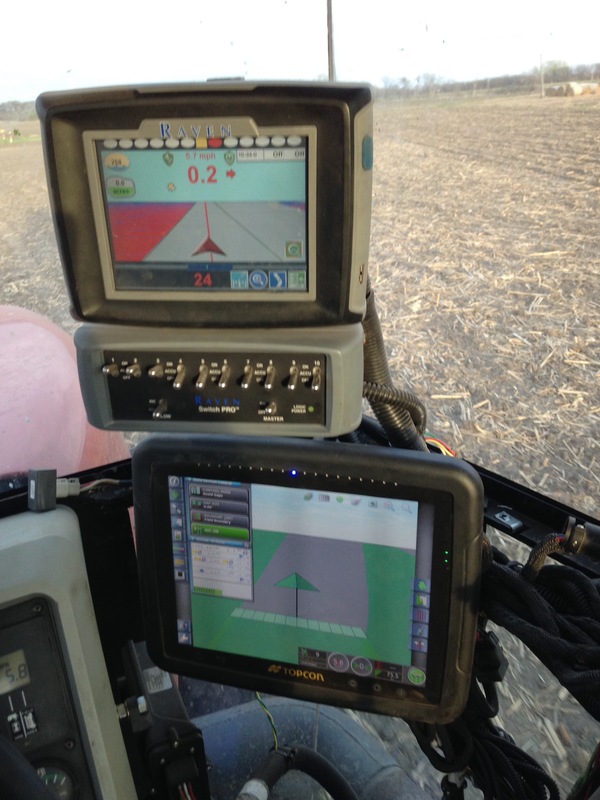 The top screen on the picture below is the GPS system which steers the tractor and uses 8-15 satellites to pinpoint exactly where he is in the field and where he needs to go. The bottom screen has two jobs: it keeps tract of where the planter is at and each row is controlled by satellite. The satellite recognizes what has been planted and shuts off each row individually as it crosses where he has already planted so there is no overlap. It’s second job is to tell him if the population is flowing right or if a row is plugged up or out of seed. And people think farmers have it rough…the machine does the planting for them! Mother nature dropped the green flag and it’s go go go time all the farmers are in the fields getting ready for this years crop. Jerry is spraying 32% liquid fertilizer. He did this instead of anhydrousing on fields that didn’t get planted last year because he didn’t want to bury the weed seed from the prevent plant ground. All other fields are getting pre corn chemical or pre bean chemical depending on the crop rotation. 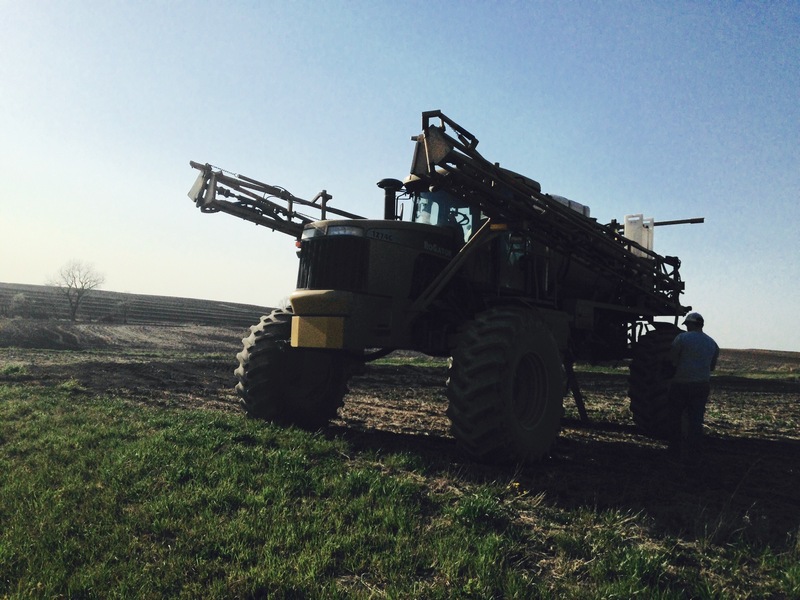 The wind has been blowing lately and has not made for ideal spray conditions, because you don’t want the chemical drifting into waterways or neighbors fields. 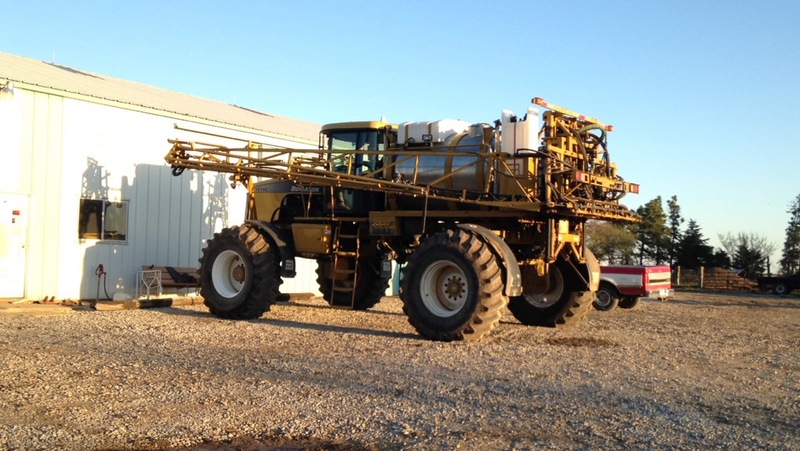 My farmer is hoping to be spraying all 1800 acres of pre corn (includes custom work) in the next five days and then start planting!